The Chef and I agree that gathering the whole family around the dinner table to share each other’s company, and good food, is becoming lost – we’d like to have it come back. Rev. Lacy will tell you that when the neighbors smell BBQ in his smoker, they want to know when to show up for dinner! Good food is an attraction that can, and should, bring us together. And it has in the past! So why not now? Here’s a recommended family dinner the Chef has successfully used with his family on many a Sunday, after church, which may be right for you. 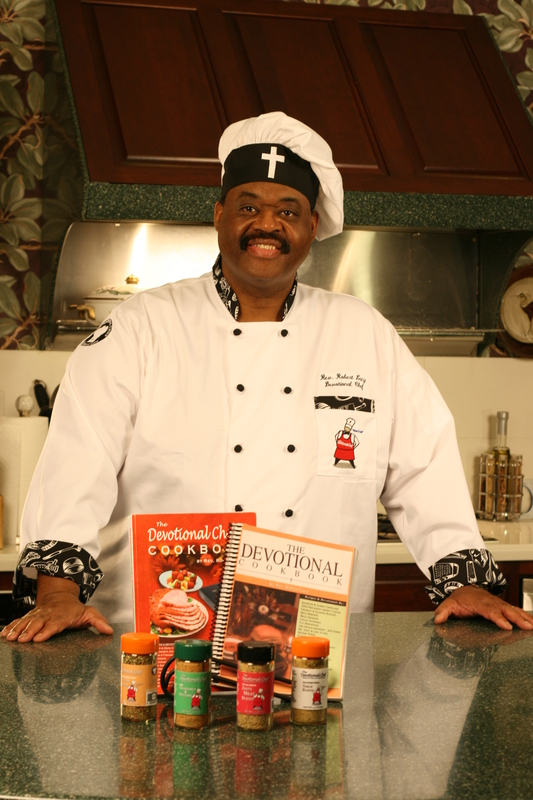 Nearly all dishes mentioned here come from The Devotional Chef Cookbook, which is being rewritten – with new dishes and new devotions – even as you read this. Go with the Chef’s own BBQ chicken, garlic bread, a salad stuffed with fresh veggies, Momma’s Corn Pudding, our modified Karen’s Potato Salad, and fresh homemade iced tea. You’ll need at least one BROILING chicken for each four people at the table. Split each chicken in half, and sprinkle with garlic powder and Creole seasoning. Each split half-chicken will go in a freezer bag to be coated with a marinade of Worcestershire sauce, smoke flavoring and Tabasco sauce – applied to taste so test the marinade mixture ahead of time. Store each bag in the fridge for 1.5 hours – and shake the bags up a couple times during that period. Bake the split half-chickens in pans for 20 minutes. Then baste with BBQ sauce and repeat. You can do this on the grill or in the smoker instead of the oven. Baste in the same marinate, grill until browning, coat with BBQ sauce and grill until crisp. Yummy either way! We’re going to post this recipe separately later. We think it’s worth it! If your family is like ours, you may not agree as to what vegetables go in. Have separate dishes of each veggie available and let the guests choose what goes into their own salad! There’s very little nutritional value in iceberg lettuce. Don’t let anyone dominate their salad with that stuff. Yuck! If you want tomatoes, go with cherry or plum whole tomatoes instead of slicing the big ones, which would make each salad a mess! And as for modified Karen’s Potato Salad, you can find the origin of this idea HERE. And Chadwick Boseman is welcome at the Chef’s home for dinner anytime! Eat hearty, friends! And listen to the Chef podcast here! This entry was posted on May 3, 2018 by Dr. Ron Graham in meals and tagged dinner, family.